A site dedicated to remembering what happens when a public servant violates the public trust. Val Stevens sent out a flier quoting officials of the City of Sultan in their own words, in statements submitted for Fred Walser's sentencing this past June, after his criminal conviction. Here are the quotes, with links to the statements. Despite Walser's claims, this was more than a "clerical error" or "memory lapse," in the words of the people who worked with him. The Democratic Party has -- since his conviction -- spent more than $75,000 on that one's campaign, mostly through the Senate Democratic Campaign Committee. I have no logical recourse but to conclude that the Democrats, the SDCC in particular, and chair Karen Keiser in particular, simply have no concern whatsoever for honesty and integrity in politics and government, having proven themselves, in the campaign of Fred Walser, to be perfectly willing to resort to all sorts of lies and corruption. These are the people who are representing YOUR PARTY, Democrats. According to Whatcom County Court, Fred Walser, you have no balance on your account: you paid the $20,000 restitution owed to the City of Sultan for your crimes. That was a remarkable achievement, and now you likely won't be going to jail for lying to a public servant, as long as you finish your 240 hours of community service before June. Granted, the fact that you lied, and lied, and lied some more, and that you are still lying about it today, ethically disqualifies you from being a public servant in any capacity, but at least you're well on your way to paying your debt to society, even if it was only a small part of what you actually cost the citizens of Sultan, and of Everett, and of Snohomish and Whatcom Counties, and of Washington State, through your lies and misdeeds. Only one week left! If you don't pay your restitution on time, your one-year suspended jail sentence could go into effect (which would make it hard to finish the Senate campaign). Don't be late! Only about 230 days left of probation, hang in there! In our last post we noted how the Senate Democrats have been propping up the campaign of recently convicted criminal Fred Walser. Indeed, now they've given him another $10,000 in cash, so that the Senate Democrats alone have contributed 39 percent of all of his total cash and in-kind contributions, almost $36,000 (with other Democratic Party committees, it goes up to almost $39,000, 42 percent). And that's not even including the cost of their lying mailer about Senator Val Stevens, which despicably accused her of "condoning or excusing domestic violence" and "blaming the victim." We proved conclusively that Stevens said no such thing. Everyone can view the video and listen to the audio. There's simply no doubt that the Democrats are lying on behalf of Fred Walser (himself convicted of lying). Now they're at it again. This time the lie is similar, saying Senator Stevens "compared domestic violence to PMS." It's the same basic lie, the only real difference being that this one makes even less sense, even given the misquote of Stevens. That they keep changing their misinterpretation of Stevens' words is a pretty telling indication that they don't even care about the truth. On this piece they add in some additional lies, such as that she "supports banning all forms of birth control." Of course none of the other claims are backed up with any sources at all, because no sources exist to back up their lies. Then again, providing sourcing didn't stop them from lying about domestic abuse, either (and even then they couldn't get the date right, claiming their misquote was from a hearing on January 4, 2008, before the legislature was even in session). It seems that Senator Karen Keiser and her Senate Democratic Campaign Committee have completely lost it. The majority of Democratic Senators can't want to see their money and their name going to waste by supporting a criminal like Fred Walser, let alone being used to spread terrible lies about a Republican colleague. It's a generally accepted aphorism that "politics ain't beanbag." But one would hope an organization called "The Democratic Party" would, generally speaking, adhere to truth, because democracy only works when people have the facts. Obviously, Senator Karen Keiser and the SDCC couldn't care less about a well-informed electorate, if the truth won't help them win. A side note: the cost of the mailings is unknown, because "Better Future for Washington," the PAC the Democrats created four weeks ago, reports no expenditures so far, which appears to be a PDC violation, as it is supposed to be reported within 24 hours of being mailed, and it was mailed last week. That Fred Walser, Democratic candidate for the 39th District Senate seat, tells many lies has been well-documented. He even told a bald-faced lie about his opponent, Senator Val Stevens, in a direct mail piece. A new mailer has gone out against Stevens, this time paid for by the Washington State Senate Democrats' soft money committee, the Roosevelt Fund, and this lie was even worse, accusing Stevens of "condoning or excusing domestic violence" and "blaming the victim." The quote they provide doesn't even come close to backing up their claims: she said, "I don't want to confuse the domestic violence issue with women who, excuse me gentlemen, have PMS... I know there are points in time when women can get out of control." But she wasn't talking about people who have been abused. The Senate Democrats are lying. You can listen to her comments in context (starting around 55:45; there's no transcript, just video and audio) for yourself. A public health nurse testified that "domestic violence is a very hard thing to measure; we have no statistics that we collect statewide that gives us a true incidence of how often this is happening." So, the nurse noted, GroupHealth researchers took a random sample of women in their HMO population in the Greater Puget Sound region, and called them by telephone, and 44 percent of them said they had been the victim of domestic abuse. Senator Stevens went on to question the methodology of the study, by noting that women might say on an unsolicited, random telephone call that they were the victim of domestic violence, even if they were not. Stevens said that women, in a random telephone survey, can "have PMS" which results in them saying they were the victim of domestic abuse, even if it never actually happened. But the Senate Democrats claim she was saying that women can "have PMS" which results in them being abused. The Senate Democrats are telling vile and despicable lies, and the proof of this is clear. It might be surprising that the Senate Democrats would send out such a shameless lie, until we realize that they have given Walser -- a convicted criminal who is currently under a suspended one-year jail sentence -- over $25,000, about one-third of Walser's total received contributions. And that's not even including this expensive mail piece, so it's clear that the Senate Democrats are propping up this campaign of a convicted criminal with a proven record, not just recently, but over many years, of covering up, inventing allegations against his political enemies, protecting his friends at great cost to taxpayers and to the integrity of our public institutions, and, of course, lying. A lot. And this time the Senate Democrats are lying on his behalf. And why not? Whatever lies they tell pale in comparison to Walser's crimes; since they've already dumped tens of thousands of dollars into his campaign, what have they got to lose by lying? Some people are angry at us for posting the truth about Fred Walser. They call it "mud-slinging." But we don't make irrelevant personal attacks, or spread lies, as Walser is doing about Senator Val Stevens. We are giving facts, and providing evidence, about subjects that are directly relevant to Walser's ability to serve in elected office. For example: Walser's pattern of not keeping confidences as part of his official capacity as a public servant, improperly revealing confidential information to department personnel, and to the media. In our review of the Pepperell scandal, we learned that as part of his coverup, Walser -- despite specifically being told not to -- warned Pepperell that she was to be interviewed by the Washington State Patrol as part of their official investigation of her. Of course, this potentially allowed Pepperell to conduct further coverups, in preparation for that interview. And it wasn't the first time. In 1994, he did the same thing. Fred has divulged comments of other command staff to other employees. Items of employee performance discussed at staff meetings will be kept confidential. Comply with the Internal Affairs' directive to not have contact with anyone regarding their investigation. You may only discuss this issue with myself. Phone calls and written correspondence apply. His problems with keeping confidences were not limited to personnel investigations, but also included, on multiple occasions, revealing confidential information about pending criminal cases to the news media, against department regulations, and jeopardizing a criminal prosecution. In August of 1991, a truck ran a stop light and killed the driver, as well as a mother and her 12-year old daughter. Walser told a reporter that he had never seen such a blatant case of "wanton disregard for public safety. ... It's the most aggravated case of blatant disregard for life I have ever seen." By this time, King County Prosectors had not even yet decided whether to prosecute the trucking company, and his written reprimand noted, "Detailed information and personnel opinions relating to the defendant's guilt were prejudicial and argumentative to a criminal case." Mistakes happen, but just over a year later, he did the same thing again. This time he didn't merely receive a reprimand for releasing information, but got an additional violation for insubordination, and lost two days of leave. Any elected official must be able to keep confidences to do their job. Walser has shown on multiple occasions over many years, and leading up to the incident that resulted in his criminal conviction and one-year jail sentence this June, that he is sometimes either incapable or unwilling to do so. The big problem with Fred Walser -- Democratic candidate for State Senate in the 39th LD -- is not simply in what he did in committing his crime, but that a very clear pattern of disturbing and unbecoming behavior has emerged throughout his career. As Police Chief of Sultan, he covered up, he minimized his wrongdoing, he disobeyed superiors, he ignored rules, and he went after people who got in his way. He did the same things at the Washington State Patrol. Walser joined the WSP as a cadet in 1967, and retired in 1995 to run for Snohomish County Sheriff. Walser initially announced his retirement for March, thinking he would be appointed Sheriff, but when Patrick Murphy was appointed instead, he pushed his retirement to June. He once again lost to Murphy in the Democratic primary, ironically saying that "Patrick Murphy is an affront to law enforcement" because of his "untruthfulness" on many issues." Just two years earlier, the son of Walser's friend Pat Slack -- Pat Slack, Jr. -- was involved in an accident. Walser was an accident investigator for the WSP and was authorized for an off-duty private traffic collision reconstruction business, and decided to help out the Slacks on his own time, completely unrelated to his work with the State Patrol. Unfortunately, Walser identified himself in the report as a reconstructionist with the WSP, something he was explicitly forbidden from doing in his signed off-duty employment authorization (as well as in a similar authorization seven years earlier). Walser concluded that Slack, Jr. was not at fault, and that his reconstruction represented "the only way the collision could have occurred." Unfortunately, this directly contradicted the report by the Snohomish Police. The WSP's Traffic Investigation Division out of Tacoma agreed with the police. But when proven wrong, rather than backing down, Walser did testify in court that his original "only way" conclusion and the police/TID conclusion were both wrong, but then he provided a new theory to exonerate Slack, Jr. TID once again testified that Walser was wrong. cost the department and the Snohomish Police Department several thousand dollars, lessened the public's confidence in the department's operation and training, and was motivated by your friendship to Patrick Slack, Sr.
Walser finally agreed to his penalty for the Slack incident on December 20, 1993 -- ironically, the very day before he was promoted to lieutenant. recent disciplinary action prior to reporting to this assignment has not changed his attitude. He has been adamant that he would do the same thing again if confronted with the same circumstances. This type of action will further subject the patrol to monetary liability. In the July-August appraisal, it only gets worse. His recent allegations involving TID commanders have had a devastating impact between divisions, particularly when Fred or his units are involved. ... Fred has filed counter allegations against previous command staff. ... this type of action increases the Patrol's investigative costs and potential monetary liability. It is my opinion that Fred's motives are completely self-serving without regard to the internal damage his allegation causes. I question Fred's self-discipline, integrity, reliability, and conduct over the issues bringing disciplinary action and his subsequent allegations and actions. Walser attempted to dodge and minimize the allegations in his response: "Whether or not I agree with [the] statement is immaterial -- my actions and enthusiasm will demonstrate my loyalty, integrity, and reliability." Fred's self-discipline, integrity and conduct are in doubt. The investigation into his allegation against two command personnel has concluded. Fred's allegations were unfounded. At the end of this reporting period, it was brought to my attention that Fred's conduct and integrity should continue to be in doubt. ... His emotional outbursts and attempts to justify his alleged improper decisions are examples of poor conduct on his part. Fred's reliability in the area of setting positive examples is seriously questioned. It's the same old Fred Walser story, over and over. Covering up. Minimizing wrongdoing. Disobeying superiors. Ignoring rules. Going after people who get in his way. Whether it was the Slack incident, the fallout from it that followed him into his probationary period as lieutenant, or the Pepperell incident, it's the same things. We realize that not everyone has followed all that we've written about Democratic Senate candidate Fred Walser, and we've written so much, and made so many serious claims, that some people think that some of what we say isn't true. We assure you, every word we've claimed is true. But it is, of course, understandable that people want to see the evidence without digging through the thousands of words we've written, so here's a summary of the major claims, with direct links and quotations. If there's anything in here you believe is not well-sourced enough, or if you have any questions, please let us know, and we will provide whatever information is required. The main document used for much of the evidence is the Everett Police Department report of the investigation of Walser. It is in three parts (hosted on the KIRO TV web site), and it is referenced below by page number (e.g., "EPD p. 1"): pages 1-9, pages 10-20, and pages 21-31. Other documents will be linked directly. is guilty of more than a mere "clerical error"
Those are the claims. Here's the evidence. See the actual guilty plea and sentencing papers, as well as various news articles. His jail sentence was suspended, except for 30 days, and that 30 days was converted to 240 hours of community service. He also received a $500 fine, $20,000 restitution to the City of Sultan, and a year of probation. He did not admit guilt when he pled guilty, but he did admit that the evidence was strong enough to convict him beyond reasonable doubt, and we agree. As noted above, his one-year sentence was suspended. If he violates probation or does not complete a key portion of his sentence -- the $20,000 restitution due on October 23, 2008 -- his suspended sentence could be enacted. Further, he has 30 eight-hour days of community service to fulfill, which must be completed by June 2009, and will take away from any ability to serve in office, if not completed before the election. On March 9, 2006, Detective Steve Clinko of the Snohomish County Sheriff's Office went to see, individually, Fred Walser and Caroline Pepperell as part of an investigation about whether Pepperell had poisoned Gayle Harvie's dogs. (EPD p. 2) Clinko gave Walser a log proving that Pepperell had used the ACCESS system to investigate Harvie the previous year. Walser told Clinko he would handle it. On May 18, 2006, Walser met with a city attorney and the city clerk, to give them information in response to a public records request by Harvie for all the ACCESS logs. Walser provided a log he created with Pepperell -- dated the same day he met with Clinko, March 9, 2006 -- that showed Harvie's name had NOT been run through ACCESS. Fred Walser is guilty of more than a mere "clerical error"
Taken alone, one could be justified in thinking that it was a mere "clerical error" as Walser claims. But there is a clear pattern of behavior to protect Pepperell (and himself) that shows otherwise: his direct violation of a mayoral order to take Pepperell off ACCESS; his false sexual harassment complaint against Pepperell's replacement; his attempt to get Sheriff Bart to violate public records law; and, of course, the fact that Walser and Pepperell printed up a faked replacement log the same day he was given the original log, and his behavior in the wake of that act. Five days later, on August 29, 2006, in an executive staff meeting, Walser said that the department wouldn't "come out clean" on the investigation. On October 3, 2006, city attorneys first discovered that Walser had known about the Clinko report for months; on October 24, WSP investigators met with city officials, put all the pieces together, and decided that there would have to be an internal investigation of Walser. On May 17, 2007, Walser received notification that there was an internal investigation of him coming, and Walser claimed he did not get a report from Clinko, and that he had turned over everything he had in response to the public records request. Walser did not "remember" he had the document until he was confronted, over a year later, with an internal affairs investigation, and then he immediately said that it was flagged and in his file all along. Walser said, variously, that it was a mere "clerical error," that it was "a report in my file that I absolutely forgot about." The facts show he is lying now, as he was lying then. This was included in the KIRO TV report on May 14, 2007: Mountlake Terrace Police Chief Scott Smith said, "[Pepperell] ran over 200 license plates of individuals for personal use. The investigation determined she would attend various functions, rodeos or different establishments and typically would find an individual she would find attractive, get their license plate and run their license plate." KIRO reporter Chris Halsne continues: "[Walser] admits he knew Pepperell had been caught using Mountlake Terrace police computers to find dates. He hired her anyway." The deposition transcript shows that Fred Walser pled the Fifth Amendment, and could not admit a simple, known, public fact -- that he knew Caroline Pepperell -- without fear of incriminating himself. This incident goes back over a decade, to 1993, when Fred Walser was an officer with the Washington State Patrol. We do not yet have the documentation, but there are a few news stories online regarding the event. Pat Slack, Jr., the son of Walser's friend, Pat Slack, was in an accident. The official report by the Snohomish Police Department showed that Slack, Jr. was at fault. Walser, as a favor to Slack, filed his own analysis of the accident, saying Slack, Jr. could not possibly have been at fault. When later contradicted by experts, Walser constructed yet another theory to explain away Slack, Jr.'s culpability. The experts testified that theory was incorrect, too. Walser cost the city and State Patrol thousands of dollars, and he explained it by saying, "I did what I thought was right." Draw your own conclusions from the facts. Our conclusion is that Fred Walser displays a clear pattern of serial dishonesty, that he habitually puts himself and his friends above the rights of the citizens, that he is unconcerned significantly with either ethics or the law, and that if elected, he will cost us all in both our liberty and our pocketbooks. 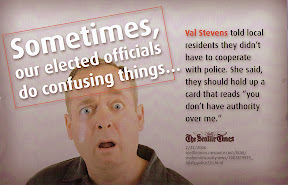 In a Fred Walser mail piece I received today, under the header, "Sometimes, our elected officials do confusing things...," Fred Walser claims that incumbent Senator "Val Stevens told local residents they didn't have to cooperate with police. She said, they should hold up a card that reads, 'you don't have authority over me.'" As usual -- Fred Walser was convicted in June of lying to public officials, and sentenced to a year in jail for it -- Fred Walser is lying. His language clearly implies that Stevens is talking about all residents and all police, but Stevens was specifically and clearly talking about tribal police having no authority over non-tribal residents. Lies by omission and implication are still lies. And what she said was based on an opinion from the state Attorney General's office, which had just concluded that tribal police officers "generally lack authority to issue citations to non-Indians for traffic activity on public roadways and highways" on reservations. Apart from the fact that Fred Walser is lying, Walser also is apparently implying that he believes that tribal police SHOULD have authority over non-tribal residents, which isn't necessarily the best position to take in the 39th District. Fred Walser continues to have a serious problem simply telling the truth, like when he filed a false sexual harassment report, manufactured a fake log in a coverup, told an officer to fake an overtime log, and so on. On Tuesday I went to a forum held by the Monroe Chamber of Commerce, in which Fred Walser took credit for things he never did, including getting money for U.S. 2 safety during the last legislative session. Fred Walser even had the gall to say he wants to work on "accountability" and "openness and transparency" in government, despite -- as a public official himself -- lying to the public for over a year. Fred Walser has not given the people a single reason to trust him in the face of his many violations of the public trust, and blatantly lying about his opponent in a mail piece isn't going to help him gain a single voter's trust. Only 10 weeks left! If you don't pay your restitution on time, your one-year suspended jail sentence could go into effect (which would make it hard to finish the Senate campaign). Don't be late! Less than 300 days left of probation, hang in there! That his wife, Monroe Mayor Donetta Walser, is endorsing him is no surprise, but how about Dave Somers, a Democrat on the Snohomish County Councilman? What message is he sending to his constituents in Sultan and Monroe? What about Mayor Don Gough of Lynnwood, Mayor Ray Stephenson of Everett, Mayor Mike Anderson of Sedro-Wooley, and State Representatives Dave Quall (D-40), Mark Ericks (D-1), and Senators Rosemary McAuliffe (D-1) and Steve Hobbes (D-44)? Are the Monroe Firefighters 3315 supporting him only because Walser's wife is their mayor, or do they actually support what Walser has done? What about the Washington State Labor Council and other unions, like the Teamsters? With the history of criminal activity unions like the Teamsters have in their past, it can't be a good thing for them to support a criminal now. The question simply has to be asked: do these people and organizations support Walser's criminal activities? If not, what justification do they have for supporting him for Senator while he is under a jail sentence? Some of them endorsed him after his conviction, of course, but they can revoke their endorsements. Apparently they haven't done so in the two months since his guilty plea, so we must assume the endorsements still stand. Traci Hoenstine, a supporter of Fred Walser for Senate, made many claims in a long letter about Walser in the July 15, 2008 edition of the Monroe Monitor. Most of them were false or misleading. The facts tell a different story. She claimed that Walser's crime was a mere "allegation." No. He was convicted. That he gave an Alford Plea does not change anything: it is a fact of law that Walser committed a crime, and was sentenced to one year in jail for it. If Walser's sentence for his crime had not been suspended, he'd be in jail right now, through the entire election and next legislative session. That Walser refuses to admit his obvious guilt is not a point in his favor. And contrary to Hoenstine's claims, it is not simply Mayor Tolson that claims he was lied to. Walser lied to several other Sultan city officials and attorneys, to the Everett Police Department, to the Snohomish County Sheriff's Department, to the Washington State Police, and others, including, of course, the people of Sultan. Walser knew full well that Caroline Pepperell inappropriately accessed Gayle Harvie in the ACCESS database -- as she had also done to others, hundreds of times, which Walser knew when he hired her -- and the very same day he was told and given the proof, by Detective Clinko of the Sheriff's Department, that she did it to Harvie, Walser and Pepperell magically produced a document that said she did not. And it was this magic document that Walser used for over a year to lie to many people, telling them Pepperell did nothing wrong. It was only when he was faced with an investigation of himself that he somehow "remembered" the original document, which was sitting right in the file all along. If Walser has nothing to hide and Pepperell did nothing wrong, why did Walser refuse to even say whether he knew Pepperell, his longtime assistant, when he was deposed in the Harvie lawsuit a few weeks ago? Hoenstine tries to throw out various logical fallacies to misdirect the readers by pointing at Walser being "gunned after" and saying "the City does it too." None of that matters, because even if entirely true, none of it justifies his crimes and misdeeds. But as Hoenstine brought up the dismissed harassment complaint against Walser, it should be noted that Pepperell was Walser's alibi for that, which might explain why he has gone to such extraordinary lengths to violate the law and ethics and common sense to protect her. Maybe some people do not believe Walser's persistent lies, coverups, and obstructions are "serious." Hoenstine doesn't. I believe she is in the minority. Also, I should note that despite Walser's U.S. 2 Safety Coalition getting credit for U.S. 2 funding in the last legislative session, it was, actually, the work of our current 39th District legislators -- Dan Kristiansen, Kirk Pearson, and Walser's opponent, Val Stevens -- in highlighting the issue and fighting for funding that made the biggest difference. That Democrats in the Senate gave credit to an organization run by a Democratic candidate for Senate should come as no surprise, and doesn't actually mean anything, especially coming from Senator Haugen, chair of the Senate Transportation Committee, who got $13m for an Amtrak station and $82m for congestion relief on a road, both in her own district, but could only find $14m for safety improvements on U.S. 2. Last year Haugen actually said that U.S. 2 doesn't get safety funding because the voters of the 39th District voted against the gas tax, and voted for Republicans who opposed the gas tax. She is, literally, punishing the citizens with more death on U.S. 2 because she doesn't like how we voted. Haugen and the Democrats have been blocking U.S. 2 improvements out of political self-interest and vindictiveness. Gayle Harvie, the woman whose public records requests eventually led to former Sultan Police Chief Fred Walser's yearlong jail sentence last month, is suing Walser's former assistant, Carol Pepperell, whom Harvie believes poisoned her dogs. Walser was deposed in that lawsuit on June 26, and he pled the Fifth Amendment to every single question that was asked, except for his name. He would not say whether he has been desposed before (after saying he had), and he would not even say whether he knew Pepperell, his longtime assistant. The Fifth Amendment to the Constitution permits people to not answer questions that could be self-incriminating. Walser has already been convicted for his crimes in the Pepperell case, so one wonders what he has to hide at this point. Did he do more that isn't on the record? It his right to plead the Fifth. But that doesn't mean he should do it. Walser is running for state Senate, and most voters expect openness from their elected officials. He can't even say whether he actually knew his longtime assistant. Is this the kind of openness we can expect from him in office? Filings from the Public Disclosure Commission show that the Senate Democratic Campaign Committee gave former Sultan Police Chief Fred Walser $10,000 for his campaign on June 17, almost two weeks after he pled guilty to providing false information and was sentenced to one year in jail. The obvious question is: if you're a Democrat on the ballot, what do you have to do to NOT get money from the party? Upon initiation of the criminal investigation into Fred Walser's coverup of Caroline Pepperell's misdeeds in the Sultan Police Department, Walser responded with a $10m lawsuit against the City of Sultan. This lawsuit claims that under the "unlawful coercion" of the "false 'criminal investigations,'" Walser tendered his resignation. We now know, of course, that there was nothing unlawful or false about the criminal investigation, and that Walser was, in fact, guilty. He therefore dropped his lawsuit. But months before his lawsuit was actually filed, and one month after the criminal investigation began, Walser offered to settle out of court with Sultan. Walser basically wanted, in addition to making sure his initial resignation date would be honored with all earned benefits (it would be), to have all investigations completed within 10 days and heard by an independent party, and to get a letter of appreciation. Oh, and he wanted a skateboard park named after him. Now, letters of appreciation and skateboard parks aside, Walser knew at this point that it was a criminal investigation that had been passed off to another jurisdiction (the Everett Police Department) to avoid a conflict of interest. Walser, if he knew how investigations like this work -- which he should know, as he was Police Chief -- knew that Sultan couldn't stop the investigation. The City of Sultan and its employees were potential witnesses to the crime, and not in control of the investigation. The city's response says about as much. Walser was literally trying to bully the city into interfering with a criminal investigation run by another jurisdiction (with a threat of an expensive lawsuit, despite claiming he was "concerned over the present financial problems the city is experiencing"). It was one of many attempts to cover up, including providing false information (which he was convicted for), and attempting to convince the Snohomish County Sheriff's Department to block legal public records requests. Maybe he would have been better off just asking for the skateboard park, although by this point, I doubt he'd have even gotten that. According to his plea agreement, former Sultan Police Chief Fred Walser was sentenced to one year in jail, a year of probation, a $500 fine, and an additional $20K in restitution to the City of Sultan. There is a misperception out there that he was only sentenced to community service. All but 30 days of the one-year jail sentence were suspended, and the 30 remaining days were converted to 8-hour-per day community service, for a total of 240 hours. If Walser's actual sentence had not been suspended, it would have kept him in jail through the entire campaign and next legislative session. It is unknown whether any Washington state legislator has ever spent an entire session in jail. It is also unknown whether he will complete his community service before the next session, although even if he does, he will still be under probation for a full year, which includes all of next year's legislative session, which means he would need permission from probation to move to Olympia. Presumably, the court will not allow him to use the Senate, or campaigning for the Senate, as community service. Even if elected, he will have to spend the full 240 hours -- six full-time five-day work weeks -- doing community service, which will eat into his time for campaigning for, preparing for, or serving in office. The $20K in restitution must be paid by October 23, 2008, less than two weeks before Election Day, when he hopes to be elected to the State Senate for the 39th District. It is, of course, illegal for him to use his campaign funds for paying off the restitution. One way or another, however, that fundraising will also eat into time he should be spending on campaigning and preparing for office. The Washington State Senate Republicans released a video about Fred Walser's Best Week Ever: filing as a Democratic candidate for Senate, meeting with his lawyers, and then pleading guilty to the crime of providing false information (see our post detailing what happened there). Then I decided to put the idea to music, with a song I called "Best Week Ever." It's what I do. Sometimes. On June 5, former Sultan Police Chief Fred Walser pled guilty to a criminal charge stemming from his administrative assistant's misconduct. Walser admitted he knew about Caroline Pepperell's history of misusing her previous position to investigate neighbors and associates but hired her anyway. Then when she was investigated for doing it while working for the Sultan Police Department, Walser provided false information to investigators. Walser claims, “I had a sheriff’s report in my file that I absolutely forgot about.” But the report from the Everett Police Department (pages 1-9, pages 10-20, and pages 21-31) tells a different story. Essentially, the evidence shows that Pepperell misused police resources to harass her neighbor, and then in order to keep her on staff, Walser lied to multiple investigative bodies, violated a mayoral order, and filed a false sexual harassment complaint against her replacement. In August 2005, Gayle Harvie's dogs were poisoned, and one died. Believing Pepperell was involved due to personal history between the two, she began looking into, among other things, whether Pepperell might have accessed Harvie's name inappropriately, using Sultan PD resources. On March 9, 2006, Snohomish County Detective Steve Clinko met separately with Walser and Pepperell about the poisoning complaint, and he told Walser that Pepperell had, in fact, accessed Harvie's name in the ACCESS computer system in June 2005. But on May 18, 2006, Walser provided a log -- dated March 9 -- in response to Harvie's records request that showed Pepperell had not accessed Harvie's name (a claim Walser would make many more times), despite Walser being told on the very same day, March 9, that she had. Walser says he later found the document and turned it over to city staff, but this was only after the investigation of him began, a year later, at which point he told the mayor he had it in the file all along, he had flagged it, and he knew where it was. Walser's public answer -- "all I did was put a sheriff's report in a file and forgot about it" -- has little credibility, just based on the facts. But the Everett PD report also shows a disturbing pattern of behavior that makes Walser's plea of ignorance seem completely unbelievable. What followed the above events is, perhaps, even more disturbing. In September 2006 it was deemed necessary to limit Pepperell's use of ACCESS, her abuse of which constituted part of the investigation, during that investigation. Walser resisted from the beginning, saying he couldn't run the department without Pepperell, but a plan was devised to train employee Tami Peavey (who already had been certified to use ACCESS) to take over. Peavey was trained, but Walser still resisted, and despite Mayor Ben Tolson's orders, Pepperell still had full access in November 2006. He said he couldn't use ACCESS himself, and needed Pepperell to do it (despite also claiming he checked ACCESS himself, to determine that Pepperell had not accessed Harvie's information). In February 2007, Walser initiated a sexual harassment complaint against Peavey, based on a meeting with three Sultan PD officers. He stated Peavey would not be allowed access to the police department from that day forward. However, one of those officers, Sean Gillespie, denied being at the event where the alleged harassment took place, denied being in the meeting, denied saying the things Walser attributed to him, and denied knowing anything about the incident. Officer Gillespie filed a grievance with his union over Walser's complaint against Peavey. The allegations against Peavey were officially dropped in March 2007. After the internal investigation of Walser was announced, in May 2007, Walser tried to convince then-Snohomish County Sheriff Rick Bart to not publicly disclose information regarding the investigation of Pepperell, claiming they should be treated as internal documents, which they were not. Walser announced his resignation four days later, and city attorneys even helped him draft his resignation letter during the investigation. Yet, he said that when he was placed on administrative leave, a few weeks after, that he was "surprised." Walser then responded with a $10m lawsuit against the city, maintaining his innocence. He has now dropped both his lawsuit and his plea of innocence, with a plea of guilty -- coming just a few days after filing to run for the 39th Legislative District Senate seat as a Democrat -- which brings with it a $20,000 fine and 240 hours of community service. We'll have more on this story in the coming weeks. There is, unfortunately, even more. We haven't yet looked at the Whatcom County papers (where he was formally charged, again, due to conflicts of interest), and there's even more in the Everett report, the now-dropped lawsuit, and elsewhere. Stay tuned, and feel free to read some of the and source documents, and news articles in chronological order, linked in the sidebar. As a police chief in the City of Sultan, Fred Walser spent ten embattled years mismanaging the Police Department. He was constantly over budget, had a worse-than-average retention rate with his officers leaving to work for other departments, and got in trouble for hiring other police department's wash-outs. One such hire would cost the taxpayers dearly, when he hired Caroline Pepperell to work as his top assistant in the Sultan Police Department. Pepperell had been discharged from the City of Mountlake Terrace for misusing police computers to find potential "dates." KIRO TV reported that Walser "admits he knew Pepperell had been caught using Mountlake Terrace police computers to find dates. He hired her anyway." According to KIRO TV's Chris Halsne, Mountlake Terrace Police Chief Scott Smith said, "She ran over 200 license plates of individuals for personal use. The investigation determined she would attend various functions, rodeos or different establishments and typically would find an individual she would find attractive, get their license plate and run their license plate." Fred Walser hired Pepperell as his top assistant and kept her history and wrongdoing a secret from officials and the public. That's not where the story ends, but where it begins. Under Walser, Pepperell once again used police department resources to snoop into sensitive files, this time to harass her neighbors in an ongoing spat. The City brought in the Washington State Patrol to conduct an investigation of Pepperell. The Mayor of Sultan concluded from that investigation that she was guilty of a firing offense and terminated her. A copy of the termination letter signed by the Mayor outlines the allegations and findings of the City of Sultan. The cost of the investigation was about $40,000, all of which could have been saved if Fred Walser had the judgment to hire someone without a history of criminal behavior to work as his top assistant in the Police Department. Who Does Fred Walser Stand With on U.S. 2? "There's no doubt that U.S. 2 in Snohomish County has seen more than its share of deadly accidents -- from January 1999 to June 2007 there were 39 fatal collisions, with a total of 47 fatalities. ... The state has an obligation to make U.S. 2 safer." "It's really brutal to say, but the people from those districts didn't support anything as far as funding," and consequently, less revenue went to districts with legislators who didn't support the tax measure, she explained. "That certainly is a big reason." And just a few months later, Haugen earmarked $13m for an Amtrak station in her district, and another $82m for congestion relief in her district, while authorizing only $14m for U.S. safety. "I ... agree that we need to work toward reducing congestion on our highways -- but not at the risk of sacrificing safety." So Senator Val Stevens, who Walser is trying to unseat in the 39th District, proposed an amendment to the transportation budget: kill the Amtrak station, and -- as Haugen herself said -- put safety first, and move that $13m to U.S. 2. So we have a simple question: does Walser stand with Stevens or Haugen? Specifically, does Walser agree with the decision to punish 39th District voters by withholding U.S. 2 safety improvements? Does he agree that an Amtrak station and congestion relief in Haugen's district are more important than safety improvements on U.S. 2? Who does Walser stand with on U.S. 2: one of the leaders of his own party, or the opponent he is trying to unseat? The voters want to know. Share your stories about Fred & Donnetta Walser! Fred Walser, former Police Chief of Sultan, ran as a Democrat for the Washington State Senate in the 39th District in 2008. He was at the time under a one-year suspended jail sentence. Walser pled guilty in June 2008 to a gross misdemeanor for providing false information about misbehavior by his assistant in the police department (whom he never should have hired). Walser's conviction highlights one of his most well-known transgressions, but it's far from the only one. He tried to convince the County Sheriff to violate public records law, filed a false sexual harassment complaint, violated an order from the mayor, and even pled the Fifth Amendment when asked whether he knew who his former assistant was. He has left the City of Sultan with a huge bill, and has left it open to huge potential lawsuits. We felt that Walser's story was not known by the public, so we put together this web site to document it. We leave this site up for historical and informational purposes, not to continue to hound Walser. We have empathy for the man, but he seriously violated the public trust, and we can't allow this story to fall into the memory hole. Rather than trying to punish him in perpetuity, this site remains as a reminder of what happened. This site is run by Chris Nandor. He alone is responsible for its content.